Everyone must have used Wikipedia and the idea to have the complete knowledge base of Wikipedia on your computer that you can use offline is really a great thing. If you have limited or no internet connectivity, this is really great news. Kiwix can be a great tool for students, researchers and everyone else who wants to use Wikipedia but have a problem with internet connectivity. ZIM file is a relatively less popular Open Source file format but very popular when it comes to access Wikipedia and other Wikimedia projects offline. You can copy/download complete Wikipedia on a USB drive and use it anywhere without internet access. The ZIM file format works on all platforms, embedded devices, and computers. 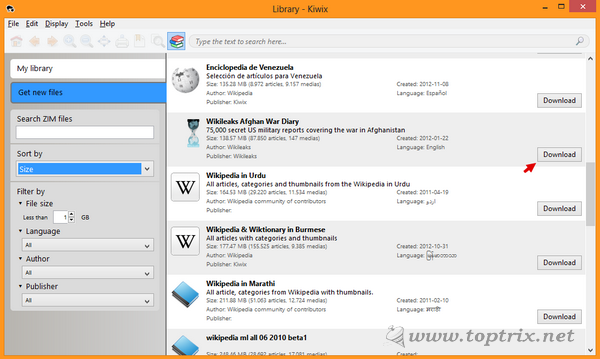 Basically, Kiwix is a ZIM file reader for Windows, Linux, and OSX. The reader application is also available for other platforms like a server, Tntnet, Java, Symbian, and many other platforms. The ready-made ZIM files of Wikipedia articles build according to languages are available for download. The size is depending upon the number of Wikipedia articles available in that language. 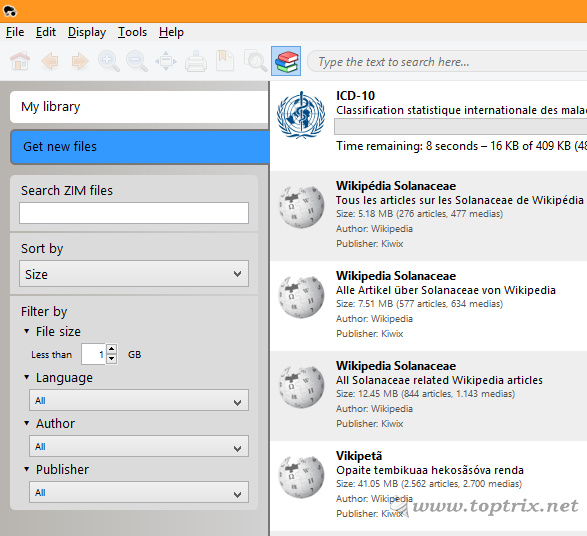 Once you download and run the Kiwix, the library button offers direct library links to download the complete ZIM archive of Wikipedia in different languages. The Library button offers you two options. When you click on 'Get new files' button, you get the list of ZIM files available for download. Here you can see that Wikipedia is not the only thing you can download. There are many other great articles other than Wikipedia. Select the respective library from the list and click on 'Download' button. The download size depends on the number of articles. You can sort the list by title, size, date, author, and publisher. Filter the list by language and author. Once you download the library, you are done. You can now put the downloaded ZIM file anywhere, either on your hard drive or portable USB drive. 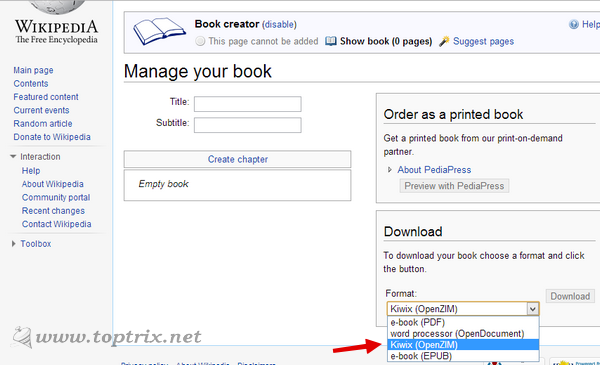 Just carry the Kiwix, ZIM file reader along and your complete Wikipedia is with you. You do not need internet access anymore. The downloaded libraries are listed in the 'My Library' tab. Load button will open the particular library. You can easily navigate through the articles using back and forward buttons. Zoom in and out to increase or decrease the text size. The full-screen option will remove the borders and search function allow you to search the whole article. A bookmark is a way to manage notes, your reading flow and you can create separate list/groups of bookmarks. If you want to take print of any part, you can do it easily. Kiwix also offers you to save the page as a text file or HTML webpage file or export the page to a PDF file. You can also create your own ZIM file with ZIM file creation. Select any Wikipedia article on the website and create your own ZIM file for offline reading. You can download the ZIM archive of Wikipedia without using Kiwix here. Download Kiwix either form Sourceforge project page or from Kiwix homepage for Windows, Linux, and OSX. If you want a mobile reader, you can download for Symbian from here.